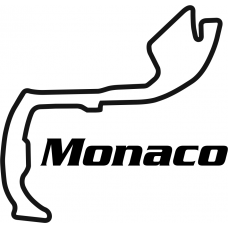 Love the Monaco GP Circuit? show your love of the circuit with our track outline decals. Supplied as a pair (2) of decals and cut to order just for you! Please choose your size and colour options from the drop down lists. If you would like this decal in another size please contact us for a free quotation. The graphic shown is an accurate depiction of the decal you will receive, the area in black is the contour of the vinyl, any white areas will show the colour of the object the decal is applied to.